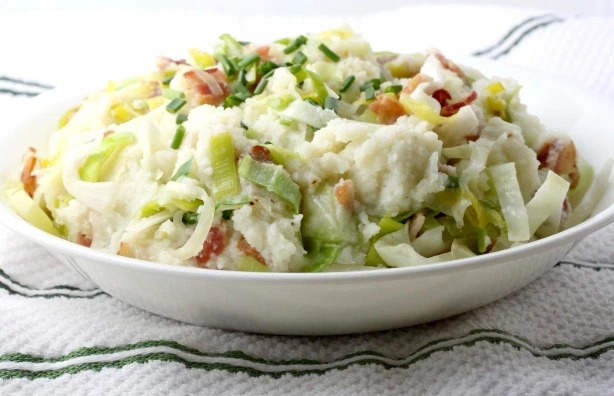 One of my favorite Irish recipes. 1. Cut the cauliflower in florets. Boil it for 10-15 minutes until soft. Strain it, place in a large bowl, add the splash of milk/kefir, and use an immersion mixer to puree until smooth. Season with salt & pepper. 2. Add the leek and cabbage to the pan with butter. Cook for a few minutes until all of the vegetables are softened. 3. Mix in the pan the puree with the veggies. Cook enough to heat through, sprinkle with chives, and serve. Variation: Make it even more interesting by also frying some thinly sliced mushrooms in step 2, and adding a bit of lemon at step 3.